I have been out searching for some good Cuban food lately. I really miss my old favorite Habana Grill at 436/434 which has now closed. Well, I still have not found a replacement for Habana Grill but I did find an admirable place to grab some Cuban favorites especially if you are on the run or pressed for time. I am talking about Cubans On The Run. 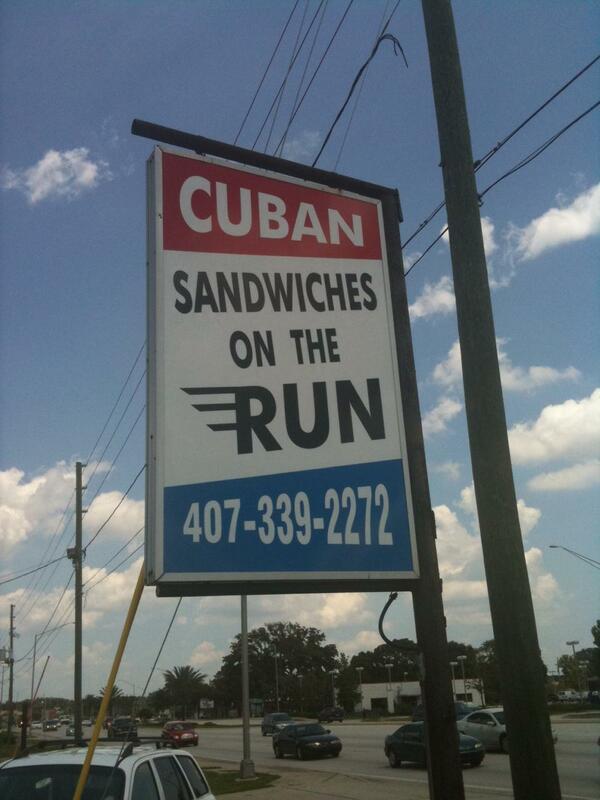 Cubans on the Run is located on 17-92 in Casselberry. The focus is the food and surely not the decor. It’s a hole in the wall but a good hole in the wall type of place. When you walk in you place your order at the register. You really have two options here if you dine in. Order one of the Cuban hot meals which you see behind the counter or order from the menu at the register, and then they will bring out the food to your table. On the first visit I tried the traditional Cuban sandwich Regular size 7″ $4.69. What a bargain! This Cuban is prepared the traditional way with Ham, Roast Pork, Swiss cheese, mustard & pickles and served hot and pressed. Talk about a great Cuban sandwich. Reminded me of some Cuban sandwiches I have tasted in Little Havana/Calle Ocho in Miami. It was that good! I also tried the Empanadas $1.50. I had the beef Empanadas. This Cuban classic is a stuff pastry with flaky crust and is usually stuffed with beef or chicken. I went for the beef. Two thumbs up for the Empanadas at Cubans On the Run. On another visit I tried one of the hot meals. Normally you will find Cuban classics like Picadillo (beef hash), Roast Pork, Steak W/Onions (Bistec Encebollado) and Ropa Vieja just to name a few. All meals are served with a choice of Rice, Black Beans or Red Beans, & Sweet Plantains $6.99-$9.25 range. I elected for the Roast Pork $8.25, with Red beans and rice. The pork was seasoned well, and it was so tender you could cut it with a fork, and the roast pork was topped with the usual sautéed onions. 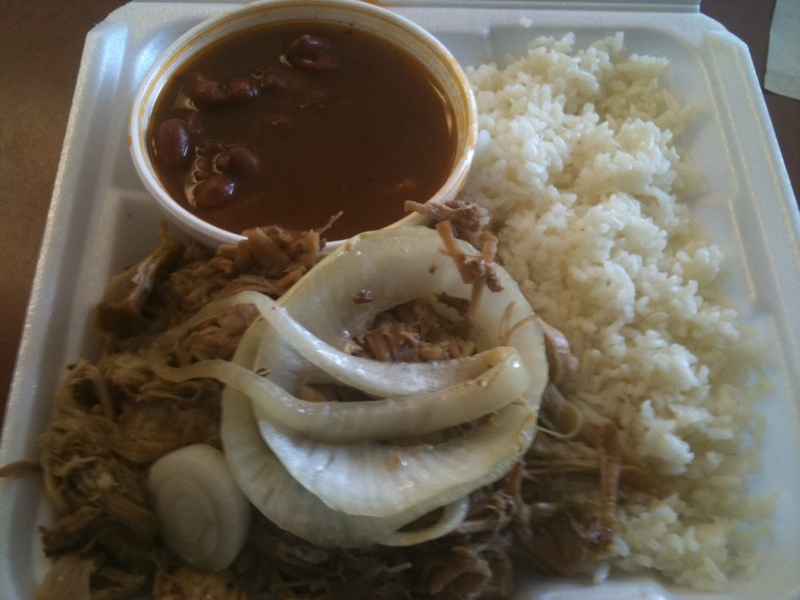 The red beans are served on the side in a separate container accompanied by white rice. Don’t worry coming out of this restaurant hungry, the hot meals portions are very sizeable. Service was prompt and friendly and polite at Cubans on The Run. Parking is tight and can be challenging. There are no frills at Cubans on The Run but if you want some good Cuban food and want it fast, Cubans on The Run is a good choice. Hours- Monday-Saturday 10:00am- 9:00 pm.